If you’re passionate about eating well, you couldn’t ask for a better travel companion than Alexander Lobrano’s charming, friendly, and authoritative Hungry for Paris, the fully revised and updated guide to this renowned culinary scene. Having written about Paris for almost every major food and travel magazine since moving there in 1986, Lobrano shares his personal selection of the city’s best restaurants, from bistros featuring the hottest young chefs to the secret spots Parisians love. 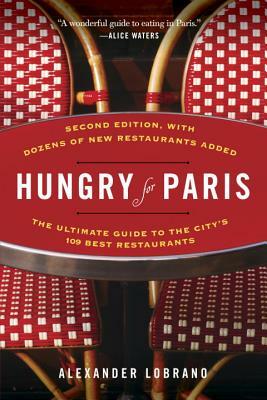 In lively prose that is not only informative but a pleasure to read, Lobrano reveals the ambience, clientele, history, and most delicious dishes of each establishment—alongside helpful maps and beautiful photographs that will surely whet your appetite for Paris. Alexander Lobrano grew up in Connecticut before moving to Paris, his home today, in 1986. The winner of several James Beard awards, Lobrano was the European correspondent for Gourmet magazine, and is now contributing editor at Saveur. He writes regularly on food and travel for The New York Times, The Wall Street Journal, The Guardian, Condé Nast Traveler, Bon Appétit, and many other publications in the United States and the United Kingdom.